THE PUBLISHER: Xulon Press. They are the largest Christian Self-Publishing company owned and operated by Salem Media Group. They have self-published over 10,000 Christian Authors since 2001. I won my publishing package through a contest they hold every year by submitting a personal essay I wrote entitled Angels Among Us. SUMMARY: Churches are often called “sanctuaries,” but the experience of Rebecca Moatz and her son was just the opposite. In “It Happened in a Lutheran Church,” she writes with heartfelt candor about how rumors about her son not only affected both their lives, but carved an ugly split in the congregation that had once nurtured them. This is a personal story, but also a cautionary tale about how churches are not immune to rumor, gossip and conflict. BACK STORY: Because Joshua was only ten years old when these incidents took place, he grew into adulthood from that point on having to work through someone else’s issues, anger and attitude that he didn’t even initially understand. Three years later, just as it was all far enough behind him to start fading away, we ran into our former pastor. The memories came flooding back, and he was then old enough to figure out what he may have been accused of. Our pastor refused to disclose that information to us. Looking at the situation three years later was both horrifying and embarrassing for him. By sharing our experience, however, we have worked through all of the difficult emotions and came through stronger from it. It is my hope that other children and their families can learn something valuable from our journey, recognize the signs of communication breakdown and make healthy decisions for themselves and those they share a house of worship with. This story is happening in a lot of churches and Rebecca was brave enough to bring it to our attention. Too many times things are swept under the carpet and left there. Too many times the scars are there and people do not see them. Too many times people give up on believing due to what they experienced at a church. This is a must read for anyone that is attending a church and feeling safe. This book will give you some insight into the possibilities and teach you to be alert. Too many times church goers attend services seeking answers to life’s questions or needing someone to care about what they are going through in life. Too many times they are taken advantage of. I am hoping this book will help those churches that do really care to be aware of the pain that is going on out there with other churches. Who knows, some of their new members could be coming from such a church. This book is a must read for anyone that cares about people and to learn as much as they can about people and what they may or may not do to you. Rebecca has opened up her insides to hopefully save others from going through what she did. It is people like these that save lives and give others hope! Although I have only been able to read the short excerpt at Amazon, I KNOW the book will be wonderful. (The best part is that I know the author). We became friends when we met in a fibro chat room years ago. We share our many ups and downs since meeting. R.L. has been an inspiration, and encouraged me with her thoughts and advice. I admire her because she has a dream, pursues, endures, and conquers through many heartaches and obstacles that most people would have give up. She has shown me that dreams can come true, when you believe. I love her for that! After I read the book I will definitely post another review. WHO MIGHT LIKE TO READ THIS: Lutherans, Members of Clergy, Members of all houses of worship, Parents of school-age children, Grandparents, Godparents. AUTHOR PROFILE: I was born in Wilmington, DE and grew up in rural Pennsylvania. A series of challenges have led me to reinvent myself many times to meet the needs of my family. I have worked in medical, technical and creative fields and have operated several in home businesses, including a daycare, and bring the sum of my experiences to my writing. With a unique balance of empathy and understanding to offer the reader, I now heal others with my words and bring a fresh perspective to some of the more difficult life situations. 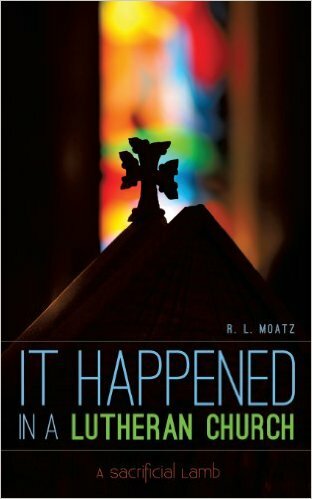 It Happened in a Lutheran Church is my first book and I have plans for many more. A recent widow, I live in Reading, PA with my son and three sensational feline siblings. Visit my blog, The Controversial Christian at: http://moonlightscribe.simplesite.com/282257900 where I write about finding inspiration in the least likely of places. WHERE TO BUY IT: My book is available through Xulon Press and Amazon.com. It can also be ordered locally through Barnes and Noble in Wyomissing, PA. There can never be too many stories to inspire the soul. Especially in today’s world. If you change only one life….